8-2-Eat is my food-focused list series. A perfect Friday distraction. This week: a list of 8 of my favorite restaurants with excellent pastas, 6 in the D.C. area and 2 in New York. 1. Fiola. This downtown Italian restaurant--the first of D.C.'s three restaurants from Chef Fabio Trabocchi and his wife Maria--is an elegant setting to enjoy a good bowl of pasta, like Fiola's famed lobster ravioli, a highlight of our 2012 dinner there. In a piece for First We Feast, Trabocchi named the lobster dish among the 10 dishes that made his career and said "having it on the menu will never change." I confirmed that the dish is currently on Fiola's menu. 2. Casa Luca. Speaking of the Trabocchis, their newer (and more affordable) restaurant, Casa Luca, also demonstrates wonderful skill with pasta. During our 2013 visit, we enjoyed agnolotti with squash, artichokes and brown butter, plus a divine smoked gnocchi with duck ragu. On the menu now: spinach pappardelle with black pepper, burrito and sheep's milk cheese. 3. Aggio. Set aside any skepticism of a restaurant-within-a-restaurant and enjoy Bryan Voltaggio's Aggio, located within his sprawling Friendship Heights establishment, Range. The food and service at Aggio was fabulous. We loved the meatballs with chittara (a spaghetti-like pasta). On the menu now: buckwheat fusilli with pork sausage, rapini and ricotta salata. 4. Coppi's Organic. Coppi's, a long-time favorite of the U Street corridor, reopened last year in Cleveland Park much to my delight. 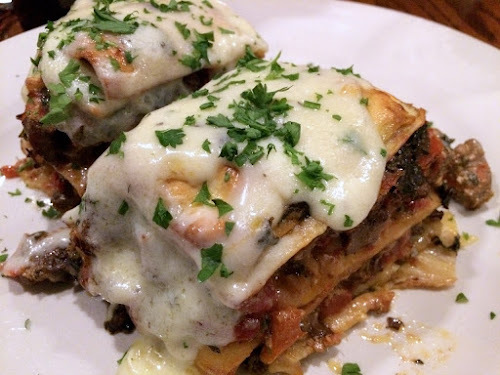 The restaurant's strip steak béchamel lasagna (pictured above), a special the night we visited, tasted far lighter than it had any business being with those ingredients, making it one of the most enjoyable restaurant lasagnas I've ever had. One the menu now: vegetable lasagna, with red pepper, spinach, eggplant, zucchini, mixed mushrooms, and ricotta; topped with béchamel sauce. 5. Graffiato. Mike Isabella's first restaurant is still my favorite of his expanding set of great places to eat, and its sweet corn agnolotti--only available seasonally--has come to overshadow his Top Chef pepperoni sauce as the dish the restaurant is best known for. And for good reason--it's pasta perfection. On the menu: the agnolotti is currently listed, but I bet it isn't around much longer. 6. Tupelo Honey Cafe. I'm picky about restaurant mac & cheese because I rarely find an example I think is as good as what I can make at home. Arlington's outpost of Tupelo Honey Cafe changed my mind about restaurant mac & cheese, its dish boasts shrimp, fresh basil and wonderful cheese flavor. The dish is a staple of the Southern chain's menu. 7. Lupa. Twice I've included Lupa on my year-end roundup of best restaurant experiences (in 2012 and 2014). It's become our favorite restaurant in New York for great pasta like tender ricotta gnocchi with a surprisingly light sausage and fennel sauce, and a summer special of pappardelle with chicken-tomato sauce. Or a wavy mafaldine pasta served with a hearty pork ragu. They run pasta specials all the time and they always sound delicious. On the menu now: sweet potato cappellacci with brown butter & sage. 8. Hearth. Our visit to Hearth was a highlight of our late 2014 trip to New York. We loved the macherroni with pork ragu in which oversized tube pasta were coated with just the right amount of meat sauce and served with rosemary and creamy whipped ricotta. On the menu now: the macherroni!